Comments: In the late 1820's, there was a resurgence of religion in southern Albemarle County, VA, and a six-member Presbyterian congregation was formed in the nearby village of Warren, just west of Scottsville. Peyton Harrison, a lawyer and owner of Belle Grove (later Valmont Farm), influenced the congregation to move from Warren to Scottsville in 1830 where it quickly grew to 16 members. The first minister of Scottsville's Presbyterian congregation was Rev. Samuel Hurd, and Harrison was appointed to be a church elder. As the Presbyterian congregation grew to 40 members in Scottsville, Harrison also provided the needed lot for their church building in Scottsville and helped finance its construction in 1832. He also financed the construction of a parsonage to house the church pastor and his family when such housing in rapidly growing Scottsville was unavailable. With the revival of religion and the growth of the Presbyterian congregation in Scottsville, Harrison felt the call to join the Presbyterian ministry. Near the close of 1833, Harrison sold Belle Grove to his brother, Carter H. Harrison, and moved to the seminary with his family. He served as a Presbyterian minister for the rest of his life, passing away in Baltimore, MD, in 1887. The following passage from the autobiography of Reverend William S. White of Providence Church in Louisa Co., VA (Rev. William S. White, D.D., and His Times (1800-1873)) further details Peyton Harrison's contributions to the Presbyterian congregation at this point in Scottsville's history. Rev/ White said he was invited to visit a session of the Scottsville Presbyterian Church in April 1832. Before his visit was over, Rev. White had been offered the position as the new pastor to replace Rev. Hurd. He moved to Scottsville in 1832, describing Scottsville then as "a small village on James river but rapidly increasing in size and importance. A turnpike had recently been constructed, extending to Rockfish Gap and inviting the trade of the Valley of Virginia in that direction. The result was that so small a village rarely ever commanded so active a trade. A hundred large Valley wagons have been seen unloading their rich freight of flour, bacon, venison hams, butter, cheese, beeswax, etc., in one day; and this when the population did not exceed five hundred persons of all ages and conditions. Small as the population was, it was too large to find comfortable habitations. A small, but neat, Presbyterian church was the only house of worship, and this incomplete when I arrived. The church contained about forty members with four highly intelligent and active ruling elders, a Sabbath-school, Bible-class, and a congregational prayer-meeting were in successful operation." "It was put into the call that I should reside in the village of Scottsville; but so rapidly had it increased in population, and so straitened were the people for house-room, that it was impossible to find a home for my family, either as housekeeper or boarder. In this extremity, Mrs. Nicholas proposed that we should reside with her, free of charge, until some arrangement could be made for our accommodation at Scottsville. We accepted her kind offer for a few weeks." "But Peyton Harrison, Esq., then a ruling elder in the Scottsville Church, determined to build a parsonage at his own charges, and, meantime, procured boarding for us in the family of Mr. Edward Tompkins, who lived about four miles from Scottsville." "With this very kind family, we boarded through the summer and into the autumn of 1832. During the following winter, we boarded with Mr. Peter White, a ruling elder in Scottsville, and an uncommonly good man. In the spring of 1833, we took possession of the plain, but neat house built for us by Mr. Harrison." "During the following summer, we were visited by the Rev. Daniel Baker, whose preaching was owned and blessed of God to the increase of the church. Now for the first time in a ministry of six years, it was my privilege to enjoy a general and genuine revival of religion. Now, for the first time, I had to guide about thirty anxious inquirers all at once. This was new and difficult, but delightful, work. About twenty-five were added to the church, including some of the most prominent persons of the village and surrounding country. They ran well, and added much to the strength of the church. One of the fruits of this revival was the bringing of Mr. Peyton Harrison into the ministry. He was a ruling elder and a lawyer. He had thought of the ministry before, but the obstacles seemed insurmountable. He had a family, a large landed estate, and many servants. The difficulty of deciding what disposition to make of these had hitherto held him back. But the active effort and prayer, called forth by this revival, so increased his own faith and so inflamed his own zeal that he hesitated no longer." "Mrs. Harrison cheerfully consented to take her children and go with him to the seminary. His brother, Carter H. Harrison, readily consented to purchase his entire estate -- land, stock, farming implements, and servants -- on his own terms. In this way, the servants were not disturbed in their domestic relations. Thus Providence opened up the way; he entered it, and in due time became a minister of the gospel. Two valuable additions were made to the session as other fruits of this revival." Other contributions to Scottsville by Peyton Harrison included the "Harrison Addition" which he provided to the town from his Belle Grove property. This 21-acre rectangle of land stretched northwest from the James River and was annexed by the a Town of Scottsville in 1831. Rev. 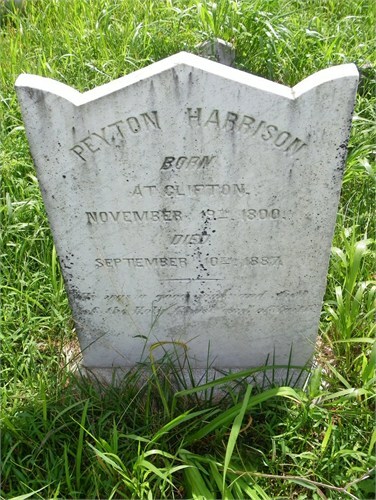 Peyton Harrison was born on 19 November 1800 at Clifton Plantation in Cartersville, Cumberland, VA, and was the son of Peyton Randolph Harrison (1769-1839) and Mary Randolph (1773-1835). On 06 January 1825, Harrison married Jane Cary Carr (1807-1859) in Cumberland, VA. After Jane's passing, Harrison married Ellen Morrow Smith on 15 January 1863 in Philadelphia, PA. Harrison passed away on 10 September 1887 and is buried at the Clifton Family Cemetery 2.4 miles north of Cumberland, MD. The epitaph on his gravestone reads: "He was a good man and full of the Holy Ghost and of faith." The photograph of Peyton Harrison is from the Ashton Wheeler Collection, Scottsville Museum, Image No. AW02cdAW01. Scottsville Museum wishes to thank Ashton for contacting us and sharing this historical image of his ancestor as well as biographical information and sources. The photograph of Peyton Harrison's gravestone at the Clifton Family Cemetery is courtesy of the Find A Grave Memorial #48388669, 20 February 2014. 1) Rev. 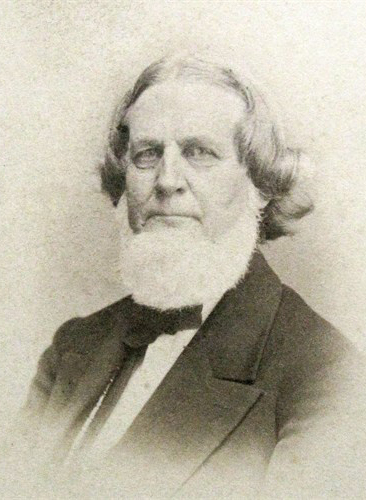 William S. White, D.D., and His Times (1800-1873), An Autobiography; Edited by His Son, Rev. H.M. White, D.D. (Richmond, VA: Presbyterian Committee of Publication, 1891), pp. 90-96. 2) Survey Report, The Clifton Cemetery, Research by Marie Keller Frazee, 29 July 1936 (Library of Virginia Digital Collections). 3) Genealogy of the Page Family in Virginia, by Richard Channing Moore Page, M.D. (New York: Press of the Publishers' Printing Co., 1893), p. 268. 4) Some Prominent Virginia Families, by Louise Pecguet du Bellet (Genealogical Publishing Co., 1976), pp. 526-527. 5) A Guide to the Records of Ante Belleum Southern Plantations From Revolution Through the Civil War, Editor Kenneth M. Stamps (VA: Virginia Historical Society, 1996). 6) History of Albemarle, by Edgar Woods (Charlottesville, VA: The Michie Company Printers, 1901), pp. 222-223.